Omar Carrum began his professional training in 1991 and joined DELFOS contemporary dance in 1993 where he developed his career as a dancer, choreographer and teacher. His training is the result of constant training in regular classes of Contemporary, Classical and Jazz, as well as workshops of various techniques and styles of movement with outstanding teachers from Mexico and the world. In addition to his studies related to dance, he has maintained a constant and deep self-taught education in different areas. He began his nutrition studies in 1996 and in 1999 he received the recognition as Certified Instructor of the Nutritional Program "La Zona". He studied and practices Yoga since 1995 and since 2005 he teaches in an independent space. In 2011 he started studying Piano and since 2005 he specializes in the Mobile Floor training system developed by the Cortocinecis Company of Colombia. Since 1993 he began to study anatomy, kinesiology and biomechanics and in 2012 after a series of chronic injuries deepened his studies of Trigger points Therapy, Alexander Technique, Training and functional tests, and began to teach classes and workshops of applied anatomy for training, the prevention, rehabilitation and self-treatment of injuries in dancers. He has been an interpreter in more than 80 works, working with choreographers from Mexico, USA, Canada and Latin America and as Choreographer he has created 33 works for: Delfos, The Professional School of Dance of Mazatlan, The Serpent Company, The Danzare Company of Guadalajara, Classical Dance Schools Aurora and Semountnori in Japan, the Dance Workshops of the UNAM and the Oxygen Project. He has made several video projects and his last short film Fifth Wall, made in collaboration with Dutch Rall, selected in the FESTIVAL DE CANNES 2013, SHORT FILM CORNER. His work as an interpreter and choreographer has been presented in some of the most prestigious theaters and dance festivals around the world. He has twice received the National Dance Award INBA-UAM, in 2000 as Best Male Performer and in 2002 the 1st Place choreography. FONCA has granted him the scholarship as Young Creator in 2003 and as an interpreter in 1995 and 2001 and as Scenic Creator with a career in 2009. FOECA in Sinaloa has been awarded the scholarship as Interpreter in 2001 and as Creator in 2003 and 2007. 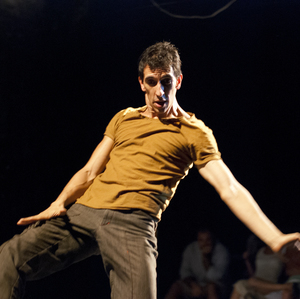 Bates Dance Festival invites him as an international artist in 2007 and as a member of the faculty in 2010 and 2012. He has been Jury of the SLP festival performers award and the Hermosillo choreography regional contest. In 1998, she co-founded the Professional Dance School of Mazatlan (EPDM) with Claudia Lavista and Victor Manuel Ruiz and since 2007 she has been the Academic Director of the same, which, in 2008, received the RAÚL FLORES CANELO AWARD for her pedagogical contributions to the formation of new generations. He is a teacher of Contemporary Dance, Moving Floor, Choreography, Jazz and Yoga. She teaches classes in the EPDM and has been invited to give Workshops and master classes in movement techniques, Creation and Yoga as well as specialized Nutrition courses for dancers throughout the Mexican Republic. Dominican Republic, Japan, Brazil and USA. Since 2007, she has created and directed the project "HABITAT, Danza y conciencia" where she has a team of teachers to teach more than 200 children in 3 marginal neighborhoods of Mazatlan. In 2009, he was the first Mexican choreographer to receive the prestigious GUGGENHEIM scholarship and, from that moment, he began a series of research projects on the transformation processes of the performer, which radically influenced his position as a dancer , his pedagogical methods and his current choreographic proposals. In 2011 she collaborated with Vladimir Rodriguez on the work Escrito Absurdo, which has had 30 presentations between 2012 and 2013 in various forums and festivals in Mexico, Colombia, France and Brazil.